Didn’t make it quite as long as the pattern called for, but VERY pleased with the results. A nice simple repeating pattern, great for working while sick, and went nicely with this yarn. Gift for L for her birthday, tried to make them as much like my favorite blue-brown mitts as possible. 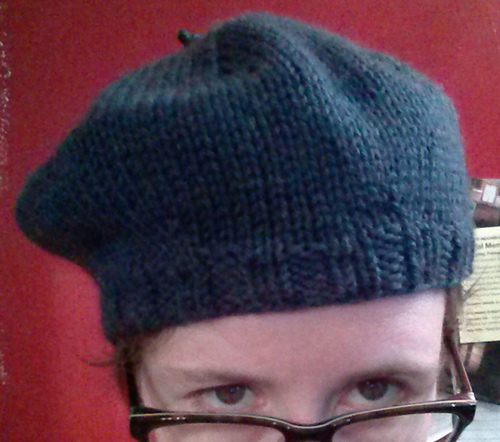 Did some of the knitting with magic loop, especially the decreases. 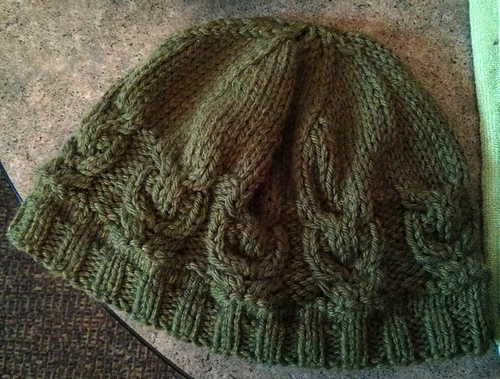 My first time blocking a hat on a dinner plate, which helped a lot. Wish I’d made it a bit bigger/floppier, but I was nervous about running out of yarn. Even so it’s very comfy. CO 20 st, 2×2 rib, changing colors every 4 rows, at least so far. Just a little something simple to keep my hands busy in meetings. finished as a little cowl on a sick day. Knit two at a time, similar to method used with socks. After knitting about a half-dozen rows, reduced down through most of the wrist (K4 reduced to K3), then increased a few near the thumb gusset. Really like how this thumb gusset is shaped, concerned at this point that the thumb portion of the pattern is a bit short for my hands. Overall hand length is a bit shorter than I prefer, if I did it again would knit about 4 more rows in pattern. A smidge tight in the hands, probably shouldn’t have re-reduced. Still look nice, mostly pretty comfy.